During the Korean War, a group of U.S. fighter pilots, flying the then newly-minted FS86 Sabre, chose to rip out the sophisticated gun-sight Lockheed had provided and replace it with a strip of gum stuck to the windshield. These pilots were known as the “gumsight brigade” and they believed their piece of gum worked better than Lockheed’s lenses and prisms. A similar mutiny has been underway in amateur astronomy in recent years, with many people coming to regard the type of complex, multi-element eyepiece pioneered by Al Nagler as inferior in sharpness and contrast to simpler designs such as the Orthoscopic, Plossl and Kellner. The rationale is that all those lenses and air-to-glass surfaces scatter and absorb light, preventing the viewer from seeing critical low-contrast planetary detail. This seems like a compelling argument. For one thing it is an attractive rejection of the consumerist values overtaking this hobby. For another, fine planetary detail is certainly hard to see at the best of times, often requiring numbing, exhausting hours of viewing to tease out, so anything that helps should be good. It should have saved money, too, but unfortunately some of the eyepieces now deemed “planet-worthy” are just as expensive as those multi-element monsters. You can see how popular this trend has become because new releases of EPs like Zeiss Abbe Orthos and Astro-Physics Super Planetary Eyepieces sell out almost at once. Meanwhile pleading wanted ads appear for Pentax’s SMC orthos. Even old-fashioned Circle-T orthoscopics (eyepieces quite unchanged from my childhood) and Takahashi’s orthoscopics got caught up in the trend. Specialist designs were resurrected, like the TMB Monocentrics. Two high-quality, expensive eyepieces on opposite side of the “gumsight” argument: a Tele Vue Ethos and a Pentax SMC Orthoscopic. Like most people, I’m a sucker for a new fad, so when some of those early articles came out panning Naglers and XLs and Radians, I naturally went out and bought some Pentax SMC Orthos and some Takahashi Hi-Orthos and others to improve my planetary viewing. So before we look at the theory a bit more closely, I’ll tell you what I found. · I believe the T6 Naglers may be very slightly dimmer and less sharp on-axis than some of the others (but sharper off-axis right to the edge). 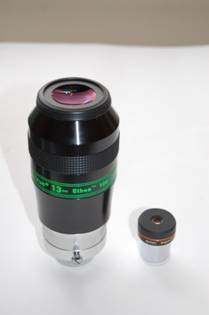 These would not be my first choice for planets, but paradoxically my best ever views of Jupiter and Mars were with T6 Naglers, due to seeing and circumstance: Naglers are useful for planets in Dob’s, due to their wide flat field. · I found the Pentax XLs and XWs and Radians to be particularly comfortable, due to their eye relief. Comfort is an important factor in seeing detail. Radians are good on-axis but show a lot of colour fringing near the edge. · The dimmest of the lot were the Circle-T Orthoscopics, probably due to more basic coatings. They were no sharper or more contrasty than the others (but not really less so either and so are a great budget choice). · Pentax SMC Orthoscopics may have the tiniest edge over the rest, but if so it is so small as to be unproveable. Then again, the eye relief is very tight, so they constantly get dirty in use – see comments on cleaning below. · As good as any and better than most are a combination of long focal length TeleVue Plossl with a 5x Powermate. This combination has great eye relief and excellent sharpness and contrast with a sensible field of view. Mostly this is what I now use for critical planetary viewing with my TMB 175. · The Nagler zoom acquitted itself very well and is an excellent planetary choice, which I use a lot. The only real issue I have with this very convenient EP is ghosting, which is worse than with most of the other designs mentioned here. Overall, apart from field of view and comfort, the differences between types are small, much less than moment-to-moment variations in seeing that make planetary detail fade in and out; much less than the difference made by ensuring your eyepieces are properly clean; much less than due to fatigue induced by tiny exit lenses and zero eye-relief; much, much less than the difference between a good telescope and a mediocre one, or between a wobbly mount with poor drives and a rock-solid one which holds the planet in centre field for an hour at a time. I haven’t tried Monocentrics or Zeiss Abbes. I’m sure they are nice, sharp, contrasty eyepieces, but I wouldn’t expect radical differences from TV Plossls or Pentax SMCs. So where does this leave those reports of vastly superior planetary detail that we’ve all read? Read on for some theory. What you see is a pretty subjective thing anyhow, but let’s look at some of the theory behind it. 1) Seeing (not transparency, but the level of atmospheric disturbance which distorts the image moment to moment). 2) Quality of the primary optics. 4) Alignment of the optics. 5) The diagonal being used. 6) The ability of the focuser to deliver critical fine focus. 8) The skill and fatigue level of the observer and their eyes. Of the things that we can control, the main telescope optics, particularly optical quality, central obstruction and collimation are the most important. For instance, whilst the differences in contrast between the eyepieces I tested were miniscule, the same could not be said of the telescope they were used in. Looking at Jupiter with a well collimated, new Meade 8” SCT side-by-side with my 8” 1/10th PV Newtonian, the differences were very considerable, with the Newt’ delivering a lot more contrast, sharpness and detail. Even the fundamental difference between a TeleVue 76 and a Takahashi FS78 on planets is greater than between premium eyepiece types used in them. The author of one of the articles I read claimed to see massive differences between a 3-element Zeiss Abbe ortho and a 5-element Televue Nagler zoom. Given that the Nagler will have been carefully designed to eliminate aberrations and constructed using ED glasses and modern multi-coatings (just like the Zeiss), is this reasonable? I don’t think so. In terms of light throughput, we are talking fractions of one percent. If an extra glass element or two made that much difference, no one would use Triplets for planets, certainly no one would ever use a Maksutov or an SCT. Perhaps the thing that makes me most suspicious of those claims is that the testers are invariably using diagonals. Now anyone with knowledge of optics will tell you that a (probably dusty, maybe slightly miscollimated) mirror placed in the optical path will scatter a lot more light than a few extra multi-coated ED lenses. If you really want to maximise your planetary contrast, start by tossing the diagonal and using the scope straight through, the way Japanese astronomers do (uncomfortable? Try gluing your eyeball to the 2mm exit lens of a 4mm ortho’ on a freezing night!) I have tried using my FS128 straight through and it does make a (very small) difference. Even more amusingly (and I am being a little cruel here) is that many of those tests purporting huge differences in planetary contrast between eyepieces are made using telescopes that are simply not well suited to planetary viewing. One of the reports I read made heavy use of SCTs. Now I have nothing against SCTs, but for visual use on the planets their often-mediocre optical quality, large obstruction and cool-down and collimation issues, make them poorly suited. Another report mainly used a Sky 90 – a fast refractor really intended for deep sky use and too small to deliver much planetary detail anyway. One way of ensuring you get the best from your eyepieces, of whatever type, is to keep the eye lens scrupulously clean. Even a bit of grease and crud can really degrade their planetary performance. In fact this is one reason I now use TeleVue plossls – if I eventually cause wear on the coatings replacement EPs will cost fifty quid, not several hundred. How do you clean an eye lens? Place a drop of optical cleaning fluid on a Q-tip and gently draw concentric circles outwards from the centre of the lens. Swap the Q-tip every few cm of travel. Finally, breathe on the lens before the fluid has completely dried and then carefully polish off with radial strokes of an optical tissue. All in all, I think many of the “gumsight” claims about simple eyepieces for planetary detail come about due to a combination of wishful thinking, rapid changes in seeing and perhaps dirty eyelenses. All the premium eyepieces I have discussed are of high optical quality and work well for planets; contrast differences between them are really very small. If you expect to replace your Radians with Orthoscopics and have a transformed view of the planets, I think you will be very disappointed. If you live on a mountaintop in Arizona and have a dedicated observatory with a ten inch, eight wave APO on a big mount, maybe spending a few thousands more on specialist planetary eyepieces makes sense (you’ll already have spent the price of a house on your rig anyway, so what the heck?). If you observe with a Celestron 8 and you live in Yorkshire, it doesn’t. If you must have a set of eyepieces specifically for planetary use, you might as well go for a simpler design, like a quality Orthoscopic or Plossl, and barlow if you need to. If you already own Radians (Naglers, XLs etc), just use those and keep ‘em clean. Spend the extra on upgrading your ‘scope or mount first. Certainly anyone owning a stock SCT, or small refractor and wanting to do some “serious” planetary observing should consider upgrading their ‘scope before buying a set of Zeiss Abbe Orthos at £400 a pop.